In June of 1846, there were approximately 15,000 Latter-day Saints strung out across Iowa in about a half dozen makeshift encampments. They had been forced to leave their comfortable homes in the city they had built, Nauvoo, Illinois. They had endured a tragic exodus across Iowa. Many had died of starvation, exposure, and disease during the cold winter and wet springtime. They had no homes, no property, and no clothing except what they carried in their wagons or wore upon their backs. Food was scarce. Some were bitter at the disinterest shown by the U.S. government in their plight. By crossing the Mississippi River, these pioneers had left the United States, and were moving west to a destination they knew not, where they hoped to live in peace. Brigham Young had written a letter on 26 January 1846 to Jesse C. Little, presiding elder over the New England and Middle States Mission. Young instructed Little to meet with national leaders in Washington, D.C., and to seek aid for the migrating Latter-day Saints, the majority of whom were then in the Iowa Territory. Young felt that maybe they could develop trails, forts, and ferries in their movement to the West. In response to Young’s letter, Little journeyed to Washington, arriving on 21 May 1846, just eight days after Congress had declared war on Mexico. Little met with President James K. Polk on 5 June 1846 and urged him to aid migrating Mormon pioneers by employing them to fortify and defend the West. The president offered to aid the pioneers by permitting them to raise a battalion of five hundred men, who were to join General Stephen W. Kearny, Commander of the Army of the West, and fight for the United States in the Mexican War. Little accepted this offer. 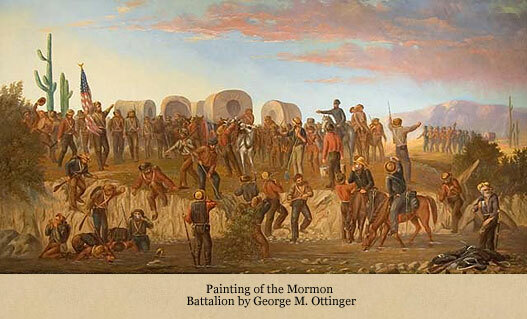 In July 1846, under the authority of U.S. Army, Captain James Allen rode into the Mormon Camp to try and enlist 500 men to serve with the U. S. Army of the West. The Mormons had many reasons to be reluctant to enlist: They had received no protection from persecution and mob action in Missouri and Illinois; their families were destitute and spread over a wide area; they had hundreds of miles of hostile Indian territory to cross; they worried how their families would suffer in the bitter plains winter; and of course, the Mormons had particularly close family ties and were concerned about protection for their families located on the western frontier. However, President Brigham Young and the governing Council of the L.D.S. Church urged the men to enlist, telling them it was their patriotic duty to join. Five companies, totaling over 543 men were mustered in at Council Bluffs, Iowa on July 16, 1846. From among these men Brigham Young selected the commissioned officers; they included Jefferson Hunt, Captain of Company A; Jesse D. Hunter, Captain of Company B; James Brown, Captain of Company C; Nelson Higgins, Captain of Company D; and Daniel C. Davis, Captain of Company E. Among the most prominent non-Mormon military officers immediately associated with the battalion march were Lt. Col. James Allen, First Lt. Andrew Jackson Smith, Lt. Col. Philip St. George Cooke, and Dr. George Sanderson. In addition to the 543 men, some of the officers chose to take their families and their possessions and their own wagons at no expense to the government, which the Army permitted. There were 15 or 16 families, including children and dependents. There were a total of 33 women, of which 20 were laundresses hired at private’s pay, and fifty-one to fifty-five children that left Council Bluffs with what was called the Mormon Battalion. The battalion marched from Council Bluffs on 20 July 1846, arriving on 1 August 1846 at Fort Leavenworth (Kansas), where they were outfitted for their trek to Santa Fe. Each soldier was issued the following: 1 Harper’s Ferry smooth bore musket, 1 infantry cartridge box, 1 cartridge box plate, 1 cartridge box belt, 1 bayonet scabbard, 1 bayonet scabbard belt, 1 bayonet scabbard belt plate, 1 waist belt, 1 waist belt plate, 1 musket gun sling, 1 brush and pike set, 1 musket screwdriver, 1 musket wiper, 1 extra flint cap. Each company was also allotted 5 sabers for the officers, 10 musket ball screws, 10 musket spring vices, and 4 Harpers Ferry rifles. In addition to their arms and accouterments, they were issued a clothing allowance of forty-two dollars, at the fort. Since a military uniform was not mandatory, many of the soldiers sent their clothing allowances to their families in the encampments in Iowa. The march from Fort Leavenworth was delayed by the sudden illness of Colonel Allen. General Stephen W. Kearny, with 300 mounted dragoon troops, had already left when they arrived, so Capt. 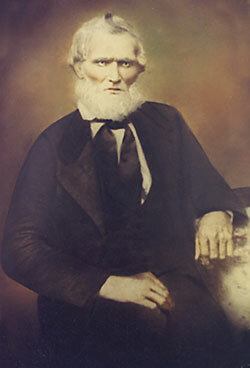 Jefferson Hunt was instructed to begin the march to Santa Fe and meet Kearny there. Capt. Hunt soon received word that Colonel Allen was dead. 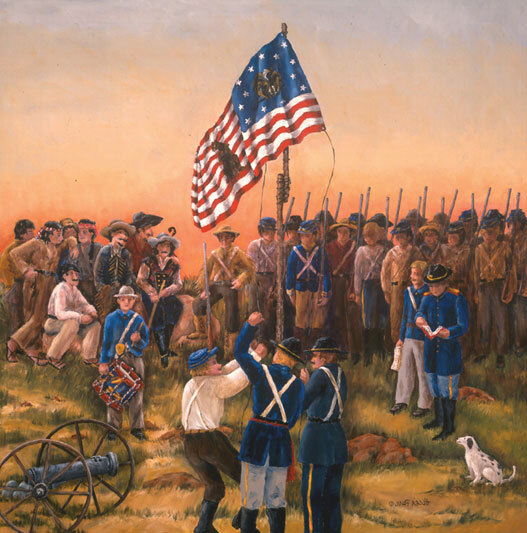 Allen’s death caused confusion regarding who should lead the battalion to Santa Fe. Lt. Andrew J. Smith arrived from Fort Leavenworth claiming the lead, and he was chosen the commanding officer by the vote of battalion officers. The leadership transition proved difficult for many of the enlisted men, as they were not consulted about the decision. Smith and his accompanying surgeon, a Dr. Sanderson, have been described in journals as the “heaviest burdens” of the battalion. Under Smith’s dictatorial leadership and with Sanderson’s antiquated prescriptions, the battalion marched to Santa Fe. On this trek the soldiers suffered from excessive heat, lack of sufficient food, improper medical treatment, and forced long-distance marches. The first division of the Mormon Battalion approached Santa Fe on 9 October 1846. Col. Alexander Doniphan, who ordered a one-hundred-gun salute in their honor, heralded their approach. 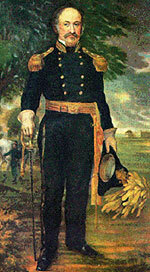 At Santa Fe, Smith was relieved of his command by Lt. Col. Philip St. George Cooke. Kearny had already left with his troops ahead of the Battalion reaching Santa Fe and left word for them to proceed on to San Diego and build a wagon road there in the process. (The Battalion left Ft. Leavenworth with 28 wagons, but only 8 wagons would survive the rigorous challenge of the march.) Cooke, aware of the rugged trail between Santa Fe and California and also aware that one sick detachment had already been sent from the Arkansas River to Fort Pueblo in Colorado, ordered the remaining women and children to accompany the sick of the battalion to Pueblo for the winter. Three detachments consisting of 273 people eventually were sent to Pueblo for the winter of 1846-47. The remaining soldiers, with four wives of officers, left Santa Fe for California on 19 October 1846. 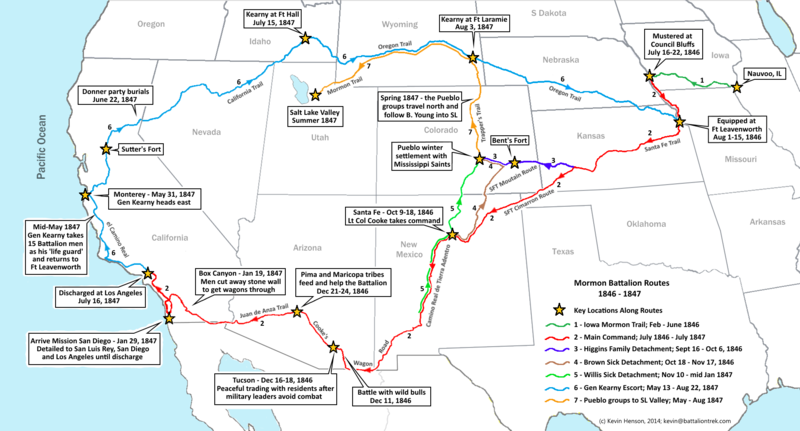 They journeyed down the Rio Grande del Norte and eventually crossed the Continental Divide on 28 November 1846. While moving up the San Pedro River in present-day Arizona, their column was attacked by a herd of wild cattle. In the ensuing fight, a number of bulls were killed and two men were wounded. Following the “Battle of the Bulls” (the only battle they fought), the battalion continued their march toward Tucson, where they anticipated a possible battle with the Mexican soldiers garrisoned there. At Tucson, the Mexican defenders temporarily abandoned their positions and no conflict ensued. 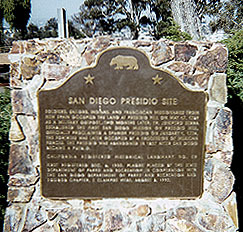 Due to the fact that the last major battle between the U. S. Army of the West and the Californios took place almost 60 days prior to the Mormon Battalion entering California, plus John C. Fremont and General Andres Pico signing the Treaty of Cahuenga on January 3, 1847 that ended the conflict in California, the Battalion did not fight any battles with the Californios. In fact, the Battalion acted as peace keeper and were friendly with them as well as greatly respected by them. After encampment on the Gila River on 21 December 1846, the battalion crossed the Colorado River into California on 9 and 10 January 1847. They camped to rest and recuperate at Warner’s Ranch warm springs from their long ordeal crossing the Southwest. 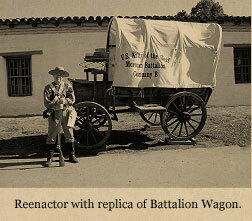 The Battalion reached Mission San Diego on 29 January 1847. That evening Colonel Cooke rode to Kearny’s encampment and reported the battalion’s condition. 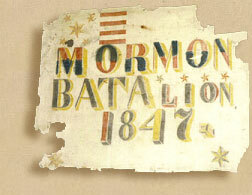 On 30 January 1847 Cooke issued orders enumerating the accomplishments of the Mormon Battalion. “History may be searched in vain for an equal march of infantry. Half of it has been through a wilderness where nothing but savages and wild beasts are found, or deserts where, for lack of water, there is no living creature.” Their march of some 2,000 miles from Council Bluffs to California is one of the longest military marches in U.S. history. the “Mormonitos” to stay on in the community. In Los Angeles, they built Fort Moore and managed to complete it in time to raise the American flag there for the first July 4th celebration, July 4, 847. Eighty-one men chose to reenlist and serve an additional eight months of military duty under Captain Daniel C. Davis in Company A of the Mormon Volunteers. Approximately 276 of the discharged members headed north on their way to the Valley of the Great Salt Lake to find their families there or still on the plains of Iowa and Nebraska. A small group of about fifty, under leadership of Jefferson Hunt followed the El Camino Real along the coast through the Catholic Missions. The rest of the group, under the leadership of Levi Hancock came up the valleys along the base of the Sierra Nevada Mountains. This group was looking for Walker Pass, but was unable to find it and continued on to Sutter’s Fort. Both groups reached Sutter’s Fort within 24 hours of each other. After resting for a few days and picking up supplies, they headed east over the California Trail, which went by way of Truckee Lake (now Donner Lake) and Truckee River. It was in the area of Truckee Lake that they met the Capt. James Brown and Sam Brannan Party coming from the Valley of the Great Salt Lake. 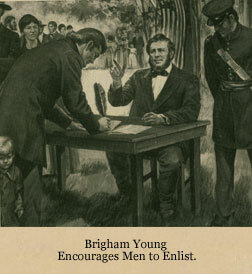 Brown had a letter to the Battalion members from Brigham Young, telling them to stay in California until spring, unless they had sufficient food, etc. for the winter. About 150 went on to the East, but over one hundred stay in Northern California for the winter, the majority finding employment with Capt. John Sutter, at Sutter’s Fort. The men worked at blacksmithing, tanning hides, etc. at the Fort, while others were building a gristmill and a sawmill in the mountains. 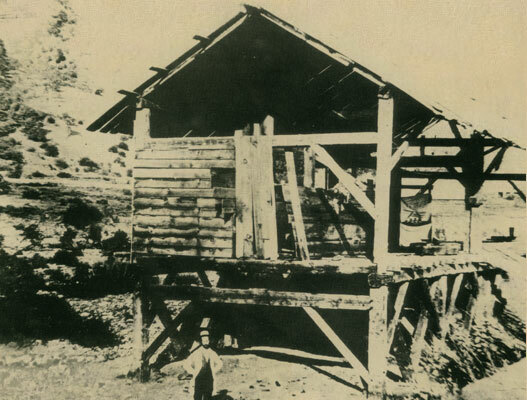 The six former Battalion men building the sawmill at Coloma, were part of the discovery of gold there on January 24, 1848, which started the California Gold Rush of 1849. It was the journal entries of Henry Bigler and Azariah Smith the established the exact date of this discovery for history. Sidney Willis and Wiford Hudson, two of the men working on the gristmill, visited the sawmill site a few days later to confirm the rumors. 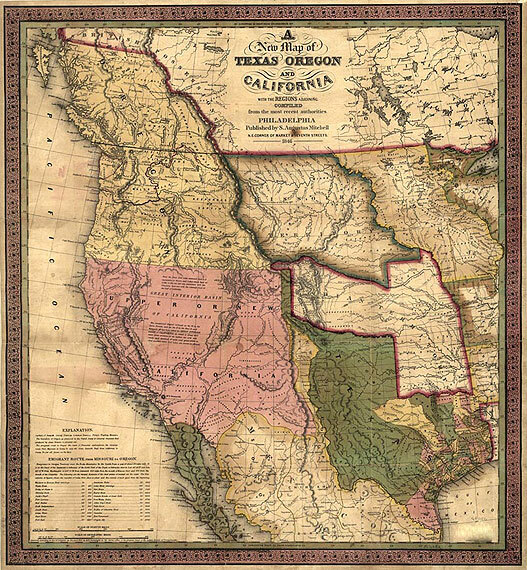 On their way back down river, they found gold at what later became known as Mormon Island, which would prove to be one of the richest areas of the gold rush.